Last week was a very tough one for the mighty Coolmore/Ashford stallion operation. On March 29 came the news that Montjeu had died in Ireland at the age of 16 after a short illness caused by septicemia, an infection in the bloodstream. Just two days later at Ashford, 17-year-old Grand Slam, who had been enjoying an excellent start to 2012, died as a result of heart failure. These two horses, standing an ocean apart, were also a world apart in type as racehorses and sires, but both more than made their mark as stallions. Montjeu, a classically-bred son of Sadler’s Wells, went two-for-two as a juvenile, taking the Prix Isonomy on his second start. He defeated the talented Sendawar in the Prix Greffulhe (gr. II) first time out at 3, but was surprisingly upset by Gracioso in the Prix Lupin (gr. I). Montjeu rebounded to go unbeaten in Europe for the rest of the season, taking the French Derby, Irish Derby, Prix Niel, and Prix de l’Arc de Triomphe (all gr. I). It’s likely he was over the top when finishing fourth in the Japan Cup (gr. I) at the end of the year. Montjeu started his 4-year-old campaign in tremendous style, taking the Tattersalls Gold Cup (gr. I), Grand Prix de Saint-Cloud (gr. I), and in a breathtaking display, the King George VI & Queen Elizabeth Stakes (gr. I, video below), defeating Fantastic Light and Daliapour in a canter. Montjeu prepped for a second Prix de l’Arc de Triomphe (gr. I) with a win in the Prix Foy (gr. II). However, in the Arc itself, he failed to show his usual turn of foot and finished fourth, beaten seven lengths by Sinndar. Pulled out again two weeks later for the Champion Stakes (gr. I), Montjeu went down by a half length to Kalanisi, and he was clearly past his best when unplaced behind the same horse in the Breeders’ Cup Turf (gr. I). Montjeu retired to stud at a time when Sadler’s Wells's standing as a sire of sires had taken a number of knocks. However, Montjeu along with El Prado (who was showing promise at the time of Montjeu’s retirement but has yet to be represented by a grade I winner) and Montjeu’s subsequent stud-companions Galileo and High Chaparral (IRE) (TrueNicks,SRO) were to prove a pivotal point. As far as Montjeu is concerned, he proved to be the international Derby sire of his era. Motivator, Authorized (IRE) (TrueNicks,SRO), and Pour Moi took the Epsom Derby (gr. I); Hurricane Run, Frozen Fire, and Fame and Glory captured the Irish Derby (gr. I); and sired from Southern Hemisphere crops, Nom du Jeu and Roman Emperor annexed the Australian Derby (gr. I) to bring Montjeu’s total of Derby winners to eight from his first seven years at stud. As a group his colts were much better than his fillies, although he has been represented by group/grade I-winning distaffers Montare, Sharvasti, Miss Keller, and Sarah Lynx, and he does have one of the favorites for this year’s English Oaks (gr. I) in Wading. If Wading were to win the Oaks, it’s quite possible that Montjeu could get the Epsom double, with his undefeated Camelot—a six-length winner of the Racing Post Trophy (gr. I)—looking a leading contender for the Derby. Of Montjeu’s stallion sons with runners, Motivator has seven stakes winers from his first two crops, including a pair of group winners, while Hurricane Run, whose first crop were 3-year-olds of 2011, aleady has nine stakes winners from that crop, five of them group winners. It wasn’t until last year that Montjeu was represented by his first stakes winner as a broodmare sire, but there were four 2-year-old stakes winners out of Montjeu mares in 2011, including the Dewhurst Stakes (gr. I) winner Parish Hall (by Galileo’s son Teofilo (IRE) (TrueNicks,SRO), so inbred 3x3 to Sadler’s Wells). Like Montjeu, Grand Slam was also instrumental in boosting his sire’s reputation as a sire of sires. 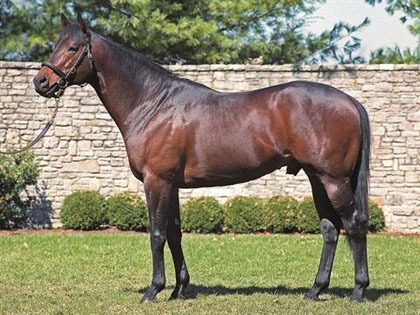 Grand Slam was a top five freshman of 2002, as was his paternal half brother Elusive Quality (TrueNicks,SRO) (in a group that also included Distorted Humor (TrueNicks,SRO), Awesome Again (TrueNicks,SRO), Tale of the Cat (TrueNicks,SRO), Indian Charlie, and Stormy Atlantic (TrueNicks,SRO)). It was the promising start by this pair, combined with the deeds of Mr. Greeley (who retired two years earlier than Grand Slam and Elusive Quality), that shot their sire, Gone West, into prominence as one of the most sought-after sires of sires around. As a racehorse, Grand Slam’s career was punctuated by a severe injury suffered when he was struck into in the Breeders’ Cup Juvenile (gr. I). He went into that race having won a 5½-furlong maiden by 11 lengths, the Futurity Stakes (gr. I), by 6½ lengths, and the Champagne Stakes (gr. I). Remarkably, Grand Slam did make it back to the races at 3. In a campaign that saw him tried over a remarkable range of distances, and on both dirt and turf, he won the Peter Pan Stakes (gr. II), was placed in six stakes events (five graded), and was runner-up in four, including an eye-catching second in the Breeders’ Cup Sprint (gr. I) on his final outing. With 10 crops of Northern Hemisphere 3-year-olds to represent him, Grand Slam has sired 65 stakes winners, including Breeders’ Cup Sprint (gr. I) victor Cajun Beat; Japan Dirt Derby (JPN-1) victor Cafe Olympus; Visionaire, who took the King’s Bishop Stakes (gr. I); millionaire Limehouse (TrueNicks,SRO); and other such notables as Strong Hope, Ball Four, Fire Slam, and Grand Hombre. A horse who had become regarded as a solid, reliable, value-for-money sire, Grand Slam was enjoying an excellent season with his runners in 2012. Sitting 17th on the sires table, he’d being doing particularly well with his 3-year-olds, which included Millionreasonswhy (also a graded winner last year); promising colt The Lumber Guy; Tribune, already a two-time stakes winner in France this term; and stakes-winning Slamit, who is entered in Saturday's Illinois Derby (gr. III).